Home International The B.R. of V. finally makes it to the U.N.S.C. The B.R. of V. finally makes it to the U.N.S.C. It’s done. The Bolivarian Government has won (unopposed) the Latin American seat for the United Nations Security Council for the 2015-2017 period. This time, there was no major drama – unlike the previous attempt back in 2006. They won it easily in the first round with 181 votes, way more than the magic number of 129 they needed. The government is already uncorking the champagne. 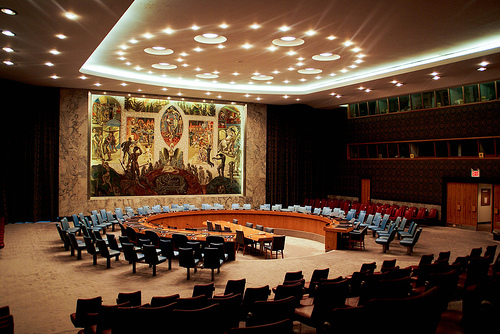 For the record, Venezuela has already been in the Security Council four times before (1962–63, 1977–78, 1986–87, 1992-93), but don’t be surprised if the hegemony sells it like a virgin, there for the very first time. After all, events in the B.C. period (Before Chávez) are already classified as terrible and, therefore, don’t really count in the new A.C. era (After Chávez). Of course, a lot of things have changed in the last eight years. But the central government will sell this a massive political victory. Even if there wasn’t any real challenger and the U.S. decided it wasn’t worth the effort to block it. Taking the post is up to the U.N. Ambassador (currently Samuel Moncada), but lots of attention will be placed on the newest member of his delegation, Alternate Ambassador Maria Gabriela Chávez, i.e., the daughter of Hugo. She will surely attend the sessions, taking her seat next to the delegation from the country that inoculated her father with cancer. Another thing to watch is if Nicolas Maduro himself will pull off an Obama and personally lead a Security Council meeting when the country assumes the presidency for a month (exact date TBA). Because the comandante eterno would have done it, had fate and politics not intervened.